What is it that makes jeans so special? When other clothes get faded and worn, we often get rid of them, but the more denim wears, the more we love it. That soft, lived-in feeling is the best. A pair of my old friends got threadbare, and I ripped a hole in the knee. I don't dig holes in my clothes; it's not my style. What to do? 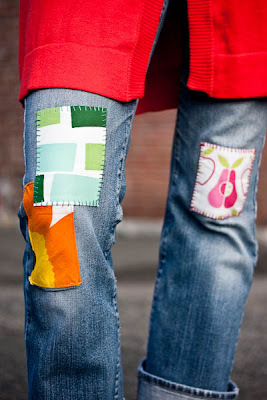 A friend of mine in high school was a stylish exchange student from Munich, and I've always remembered these cool jeans she wore that had fabric patches all down the fronts of the legs. Remembering that, I dug through fabric scraps we have at Storey left over from when we made all the projects in our book Sew & Stow. Once I had selected an orange floral print from Marimekko, I sewed it over the hole. The problem with fading jeans is that once they start to go, they really start to go. Another tear followed, and then another. I have three patches on the jeans now, but I kind of think the more the merrier. I've been mending my favorite jeans with denim patches. I like your patches MUCH better!